Eustace was educated at Dulwich College, and at St Thomas�s Hospital where he qualified M.R.C.S., L.R.C.P. in 1908. He then took his M.B., B.S. a year later. 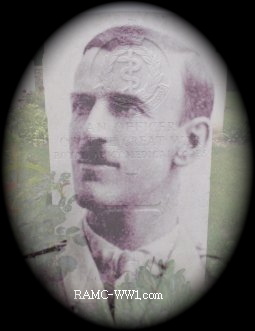 After acting as clinical assistant to the Children�s Medical Department of St Thomas�s he took up a commission within the Medical Services, at the rank of Lieutenant, on 30th January 1909. On 29th January 1910 he was seconded to St Thomas Hospital, during which time he held the appointment of Ophthalmic House Surgeon. On 11th May 1911 he was seconded to the Egyptian Army, remaining with them until the time of his death. During this time he had gained promotion to the rank of Captain, from 30th July 1912, in the R.A.M.C, as well as holding the rank of Bey in the Egyptian Army. During the early months of 1914 he took part in the Zeraf Valley and Mandal Sabai Patrols, and in 1916, in the operations in Darfur, for which he was awarded the Sudan Medal with three clasps. He was mentioned in despatches for his work on connection with Darfur. In 1918 he took part in the Hedjaz operations. On 31st August 1917 he was decorated with the Order of the Nile (4th Class). He died very suddenly at Khartoum.